LEON Day – halfway mark to Christmas. Leon is Noel spelled backwards. It is celebrated on June 25th, i.e. the turning point when Christmas begins to come closer on the calendar. For the first time ever, Syracuse had a LEON Festival to celebrate LEON Day. Local radio station Sunny 102 played Christmas music all day, Onondaga County Park and Recreation put up a few Lights on the Lake displays and many free family oriented activities. After sunset, the dropped an Orange Ball half way to mark the half way point to Christmas followed by fireworks. 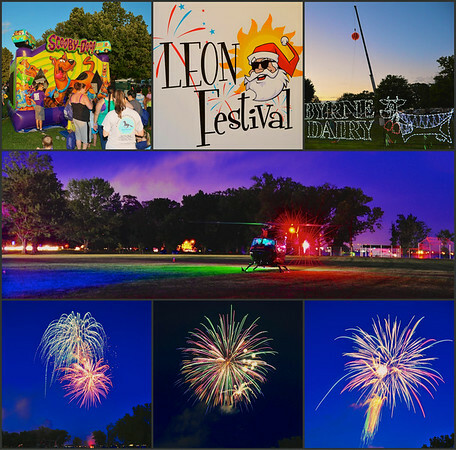 LEON Festival montage at the Onondaga Lake Park in Liverpool, New York. From top left, a Bouncey House was one of the free activities for the kids, LEON Festival logo, a Lights on the Lake display with the Orange Ball in the background. A series of firework photos from the show at the bottom. The middle photo is the Mercy Flight helicopter getting ready to take off from the festival grounds after the fireworks show. LEON Festival was delayed a day due to some very inclement weather in the Syracuse area on June 25th. Did not deter from the enthusiasm of the large crowd which attended including Santa Claus, Elves and many families. This entry was posted in Travel, Weekly View and tagged 24-120mm, festival, fireworks, helicopter, leon day, liverpool, long exposure, mercy flight, new york, night, nikon D700, Onondaga Lake Park, sunny 102, syracuse, tripod, vr. Bookmark the permalink. Oh my! I would not even want to think about Christmas at this point in the year!